TUALATIN — When rivals clash, the action can be crazy. It can be wild. It can be intense. That's certainly the case when the Tigard and Tualatin high school football teams match up. Friday's game definitely seemed to feature all of that. And, for the Tigers, it featured one more thing — an emotional, hard-fought victory. 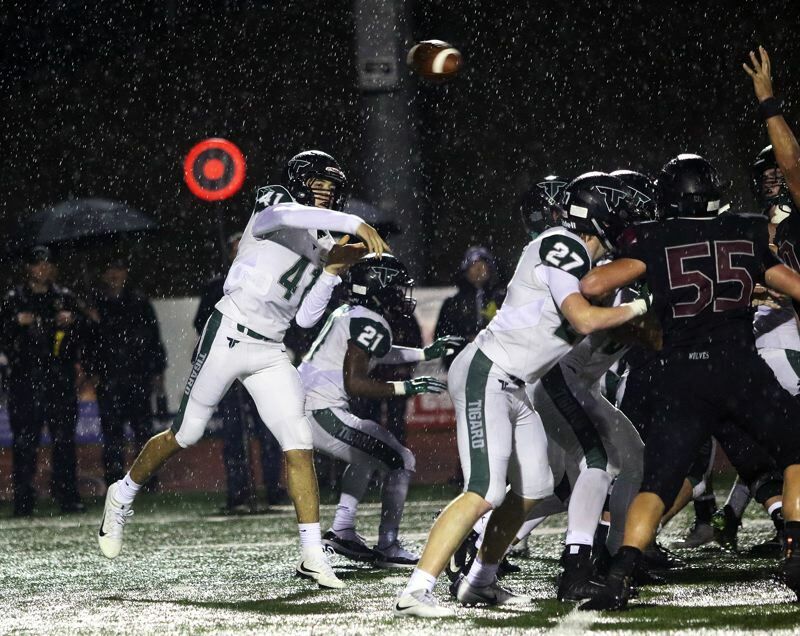 The Tigers, after losing the lead early in a roller-coaster ride of a second half, rallied to get a 27-14 win over the Timberwolves — with the outcome in doubt until Tigard senior Malcolm Stockdale scored on a 38-yard run with less than a minute left to play — in a Three Rivers League game played under rainy skies Friday at Tualatin High School. 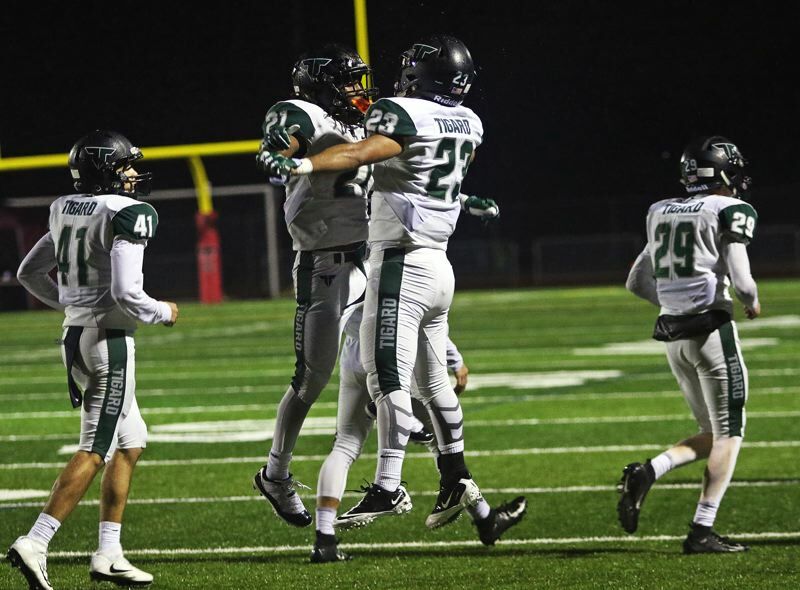 "It was just great playing them," Tigard junior receiver/defensive back Max Lenzy said. "They're our rivals, so it was great to get out there and beat them, just pounding it down their throat and keep up the intensity. It's always a great game when we play them. The intensity is always way up there." "This is a big one," said Tigard senior receiver Jazz Ross, who had a go-ahead touchdown catch in the second half. "It showed us how we can come together as a group. They challenged us, and we didn't separate, we stayed together and we got it done." 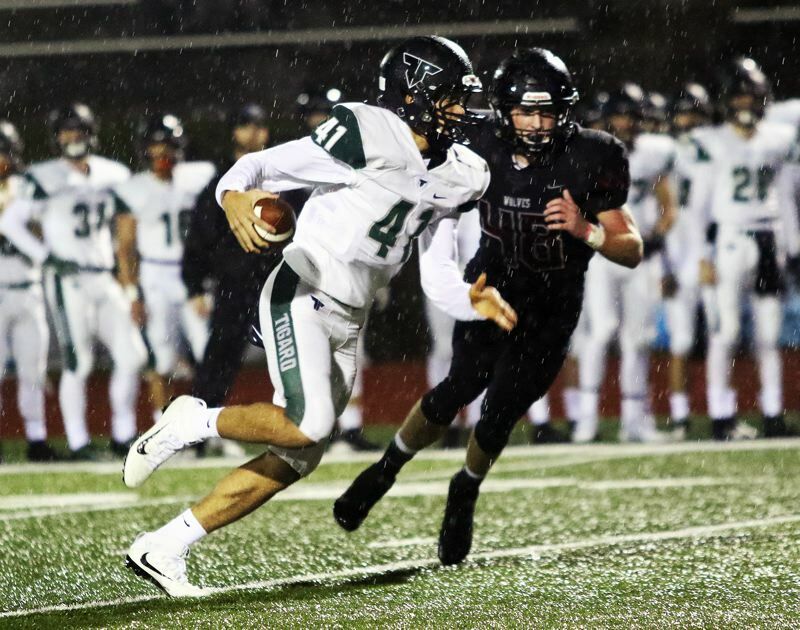 "It went well," Tigard sophomore quarterback Drew Carter said. "We tried to control momentum, stay together and get the job done. This was huge." 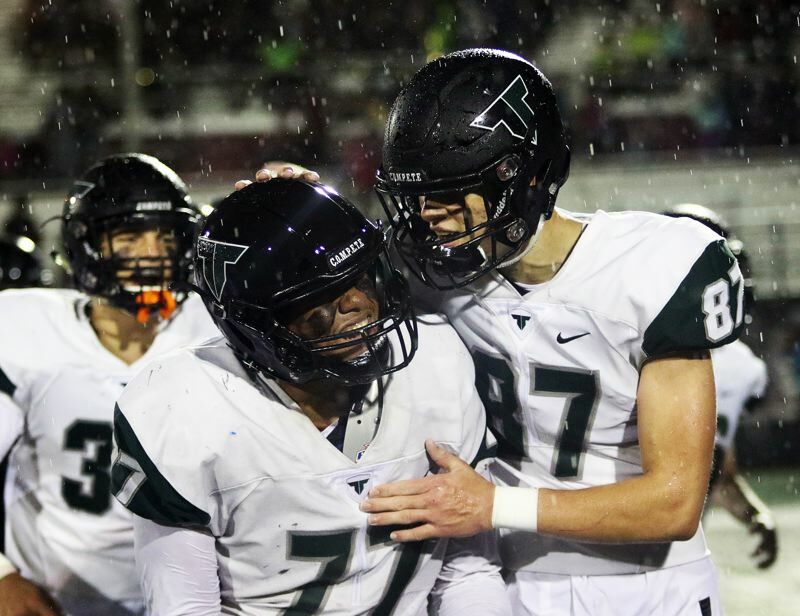 With the win, coming in the regular-season finale, Tigard improved to 4-1 in TRL play (8-1 overall), putting the Tigers in second place in the final league standings behind just Lake Oswego (who didn't play Tigard this year), which went 5-0 in league play. 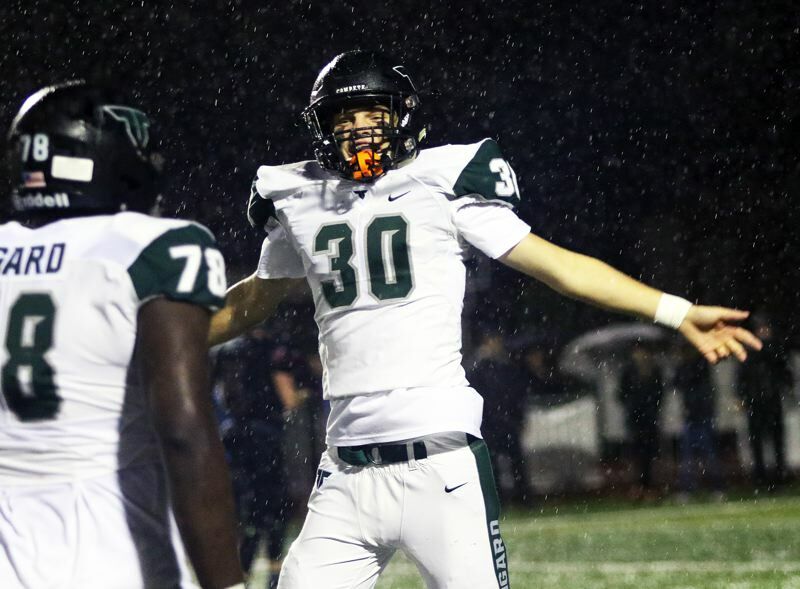 "I think this is a really big win," said Tigard senior linebacker Carter Dennis, who had a key interception to help set up a second-half touchdown. "Tualatin is another really good team in the state, and this is going to help us, hopefully in the playoffs down the road." 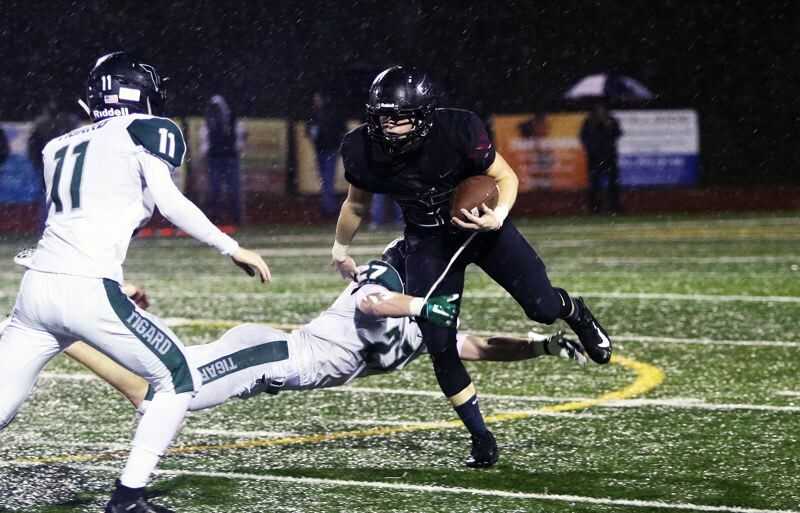 Tualatin moved to 1-3 in TRL games, and to 6-3 on the season, with the setback. 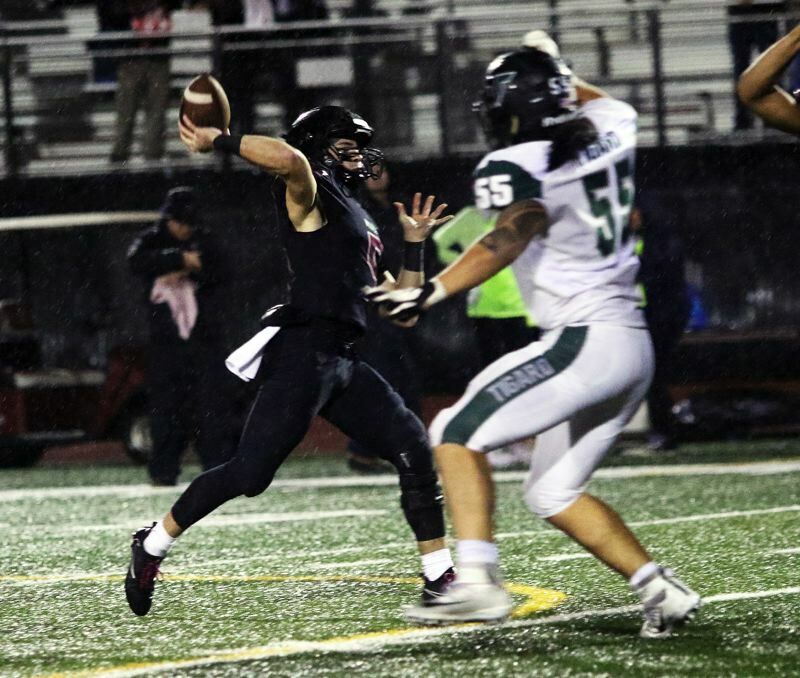 "It was good," said Tualatin senior quarterback Kyle Dernedde, who threw a touchdown pass in addition to having a big night punting the ball. "I thought we had a solid week of practice. We had been punched in the mouth the past two weeks (losses to West Linn and Lake Oswego), and we kind of figured this week was going to be our week, but that was a hell of a football game. It went down the last few minutes of the game. Both defenses played their hearts out and both offenses moved the ball. That's why we play football right there. That's Tigard-Tualatin, and that's why it means so much." Tigard got off to a fast start to the contest. The first time the Tigers had the ball, they put some points on the scoreboard. A 23-yard pass from Carter to senior tight end Noah Jackman, coming on a fourth-and-1 play, helped set up a 4-yard touchdown run by Stockdale, which gave the Tigers a 7-0 lead with 3 minutes and 50 seconds left to play in the first quarter. But, as for scoring in the first half, that was it. 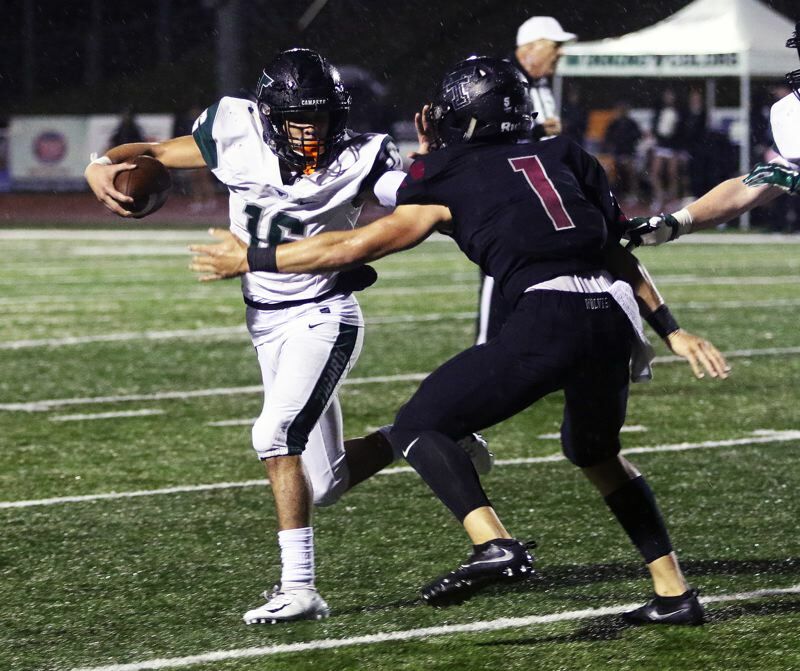 Tigard did get a 73-yard pass from Carter to Ross, but the Tualatin defense stiffened after the big play, forcing the Tigers into a field-goal attempt, which failed. That left Tigard still holding a 7-0 advantage going into the halftime intermission. But things turned dramatically early in the third quarter. 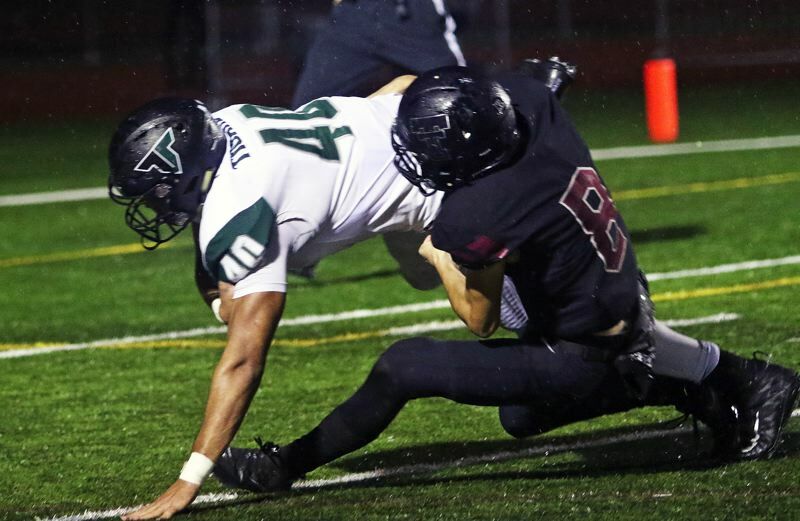 Tualatin senior Jake Anderson recovered a Tigard fumble on the second-half kickoff. On the very next play, Dernedde connected with senior Caden Dickson on a 33-yard touchdown pass play, tying the game at 7-7 with 11:49 left to play in the third quarter. 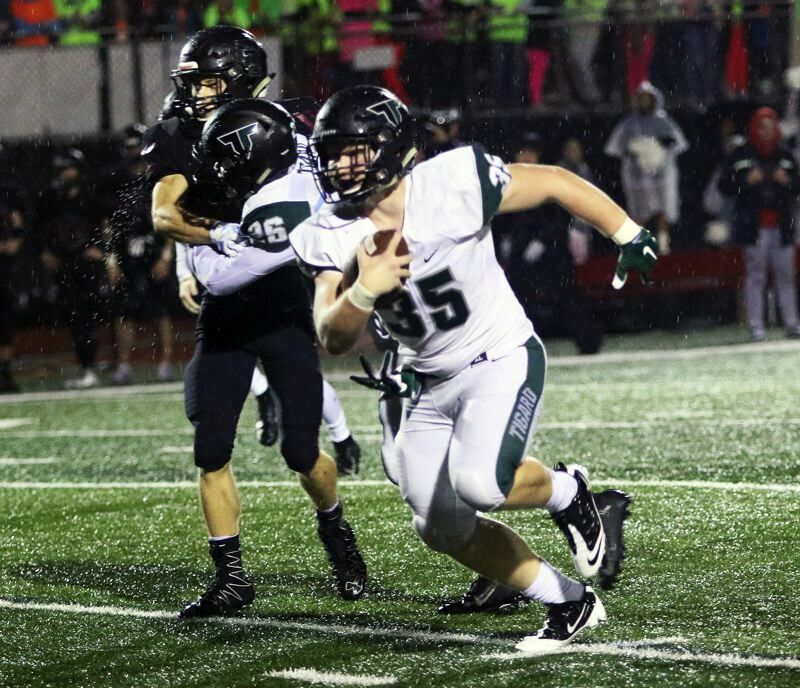 After the Tualatin defense forced Tigard to punt in its ensuing possession, the Timberwolves struck again. This time, it was senior running back Dominique Loggins scoring on a 54-yard run, giving Tualatin its first lead of the game, at 14-7, with 9:14 left to play in the third quarter. "We saw we were down 7-0, and we wanted to see what we were made of," Dernedde said. "We took it upon ourselves to come out and compete and try to smack them in the mouth. But, unfortunately, they got back up. The second half was a battle." Yes, it was. And sudden 14-7 deficit didn't deter the Tigers. "They're going to make big plays. It's a big game," Carter said. "They made some big plays, and it was all about how we were going to respond." "We wanted to overcome," Lenzy said. "One of our slogans is 'compete,' and the 'O' in that is to overcome. We worked so hard, and we're not going to give up." Tigard tried to answer back right away. 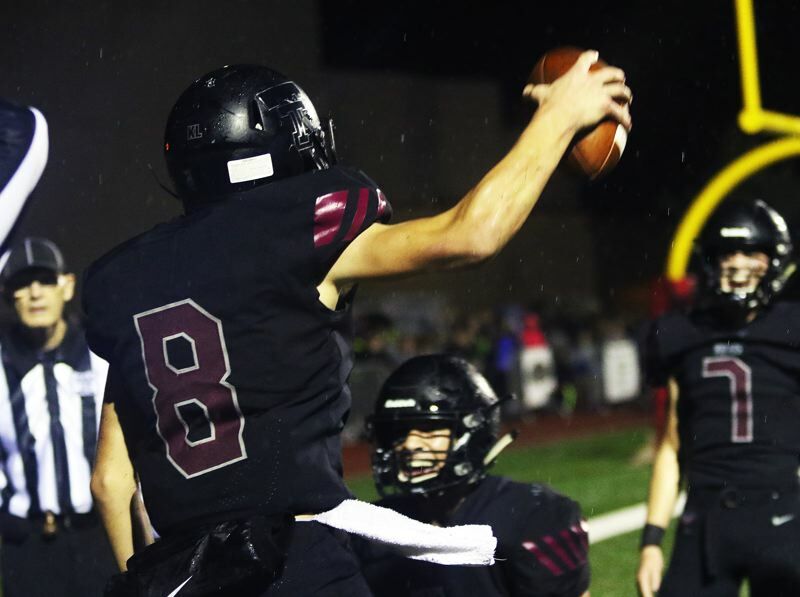 A 34-yard pass-and-run play from Carter to Lenzy helped the Tigers move the ball to the Tualatin 1-yard line, where they had a first-and-goal situation. 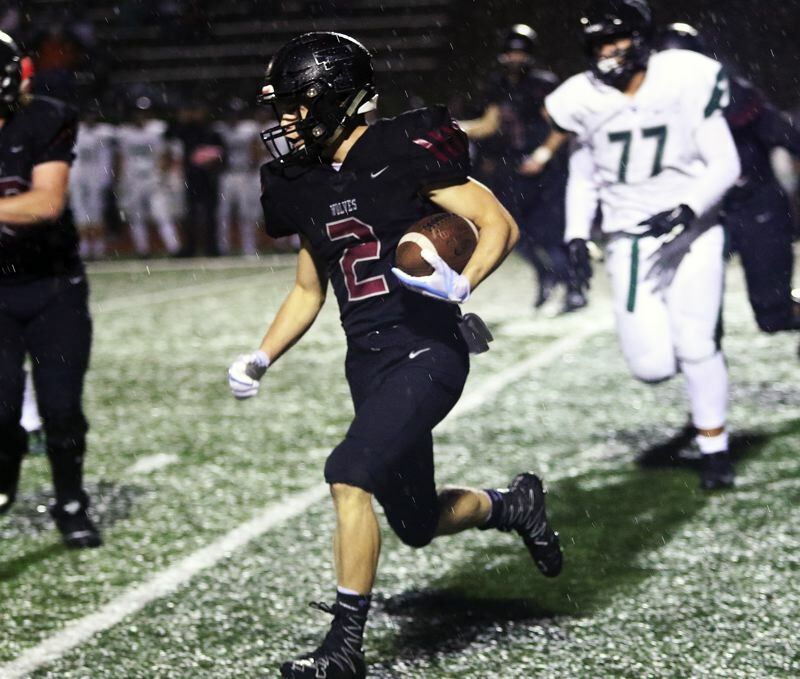 But, following a pair of illegal procedure penalties, Tualatin junior defensive back Cade McCarty intercepted a Tiger pass in the end zone. But the Tigard defense answered back. Just two plays later, Dennis intercepted a Tualatin pass, returning the ball nine yards to the Timberwolf 21-yard line. "That was a big game-changer," Dennis said. "Coach (Shane) Kessler made the defensive coverage call, and I just read the guy right, but if we wouldn't have got pressure in there to force the quarterback to roll out, I never would have made that interception. The D-Line was almost the biggest thing on that." From there, Lenzy ran the ball 19 yards on a reverse to the Tualatin 2-yard line. Two plays later, Stockdale punched it in from a yard out, tying the game at 14-14 with 2:00 left to play in the third quarter. Another interception, this time by senior defensive back Dylan Burch, got the Tigers going again. 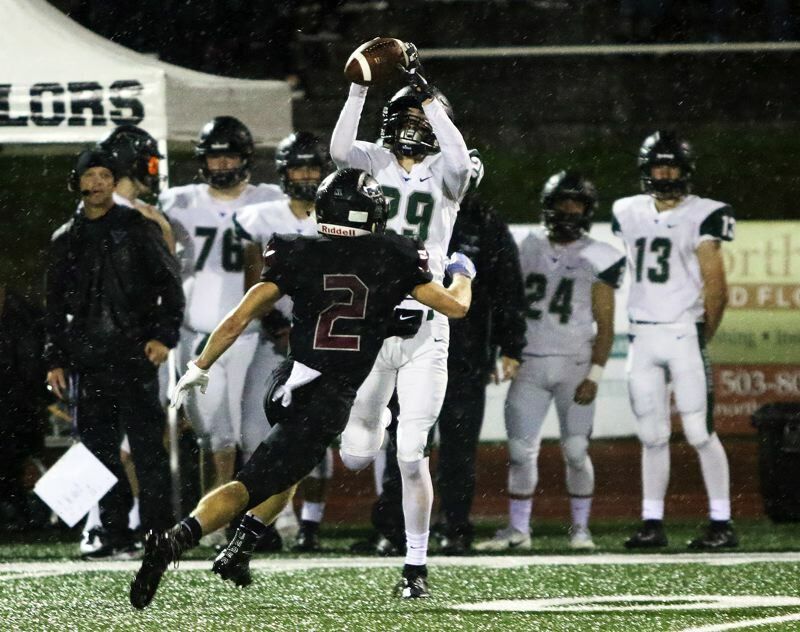 On the first play of the fourth quarter, Carter teamed up with Ross for a 44-yard touchdown pass play, which gave Tigard a 21-14 lead. "They were playing man, it was the outside linebacker on me, I knew the safety was going to go with Max, so it was open," Ross said of the scoring play. "Drew made a great ready, and got me the ball. I was a little bit nervous, but I told myself I've got to get this in. Drew made a great pass, the linemen were blocking great, and I needed to do it for them." "The line blocked great. Jazz ran a great route, and I hit him," Carter said. "That felt great." 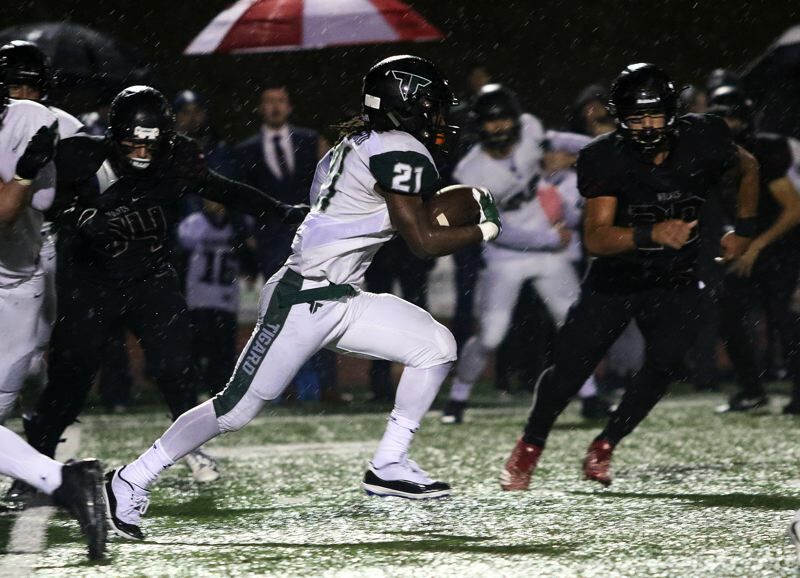 Tigard was still holding the 21-14 lead as time was running down. With just 58 seconds left to play, the Tigers faced a fourth-and-1 at the Tualatin 38-yard line. Tigard decided to go for the first down. But the Tigers did better than that. Stockdale broke through a hole in the line and ran 38 yards to the end zone for a touchdown that upped the margin to 27-14 with 50 seconds remaining. "Oh, that was great," Lenzy said with a smile. "It was fourth down, we needed just this much, and he broke it free. I was like, 'yes.'" "That was a big play," Dennis said. "That was the first time all season that I've played that wing position. I came across in motion and made a the kick-out block. I did that all last year, so I knew it was going to be a good play. I didn't even know what happened. I hit the guy, turned him around, pushed him into the ground, and I heard all the screams and then saw Malcolm sprinting down the field. I knew we needed just the one yard, so, I said, 'OK, the game's in the bag, we've got it now.'" "It was crazy," Carter said. "We were all saying that we worked the whole year to get one yard. We just needed that one yard, and he broke through for the touchdown." 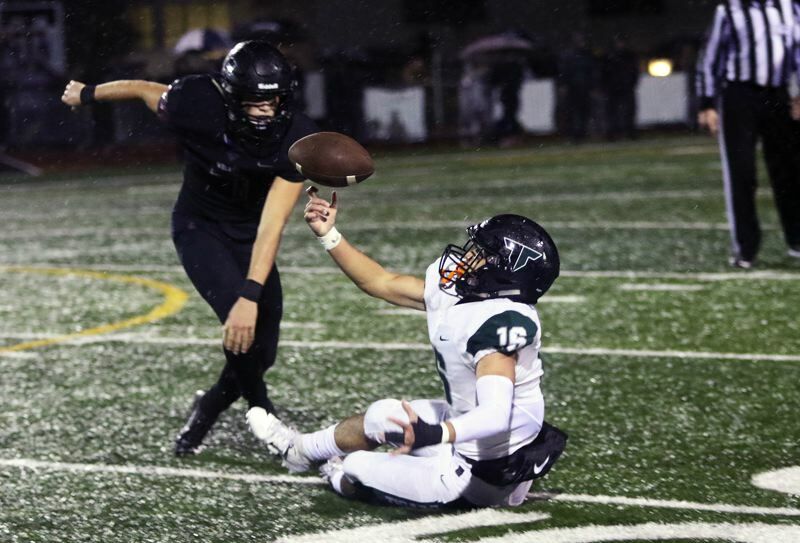 Tigard junior Josh Burns then fell on a loose ball on the ensuing kickoff, wrapping up the 27-14 win for the Tigers. "This is just great.," Ross said. "We started off and went up, then they came back and went up 14-7. A lot of momentum was going their way, but we said, 'OK, we're fine, just stay poised, and we're good. We stopped them on defense and then made a couple big plays." "We didn't give up when they got the lead," Dennis said. "We knew that we just needed to come together and just work, and keep going with what we were doing in the first half." Stockdale was a workhorse for the Tigers in the win, carrying the ball 40 times for 207 yards and three touchdowns. Carter completed 12 of 18 pass attempts for 249 yards. Ross had five catches for 149 yards. Lenzy had four receptions for 58 yards and he ran the ball three times for 32 yards. For the Tigard defense, Dennis and Burch each had an interception. Ross and Burch each had a tackle for a loss. For Tualatin, Loggins ran for 97 yards on 11 carries. Junior John Miller ran for 26 yards on six carries. Dernedde completed five of 12 pass attempts for 55 yards. Dickson had two catches for 37 yards. For the Tualatin defense, McCarty had an interception, Anderson and senior Alex Armstrong each had a fumble recovery. Miller had two tackles for losses. Loggins and junior Josh Bosepflug each had one tackle for a loss. "This was a lot of fun," Dernedde said. "There were a lot of factors, but that was good football." Both teams will open the Class 6A state playoffs next Friday. 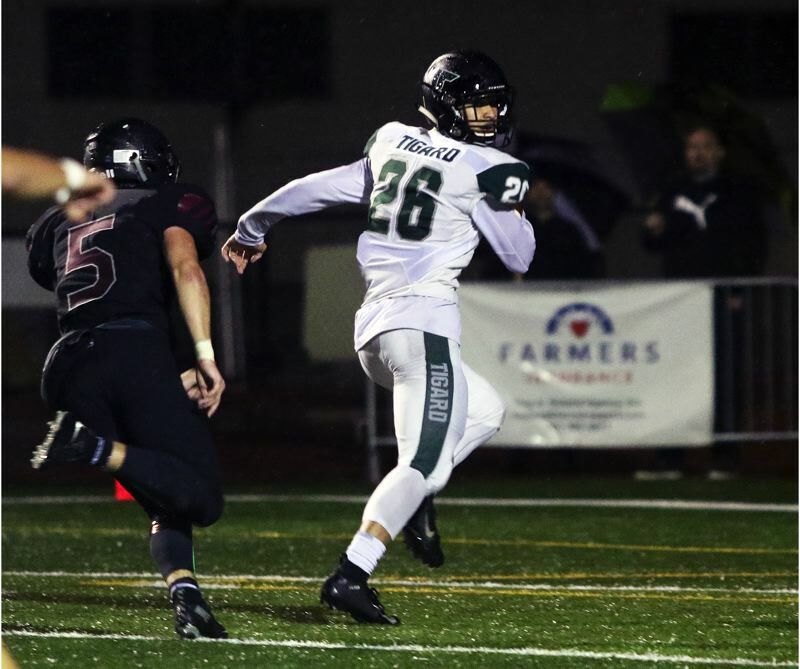 Tigard enters the postseason as the No. 5 team in the final OSAA power rankings, while Tualatin is at No. 9, meaning both teams will have home games in the first round of the playoffs.